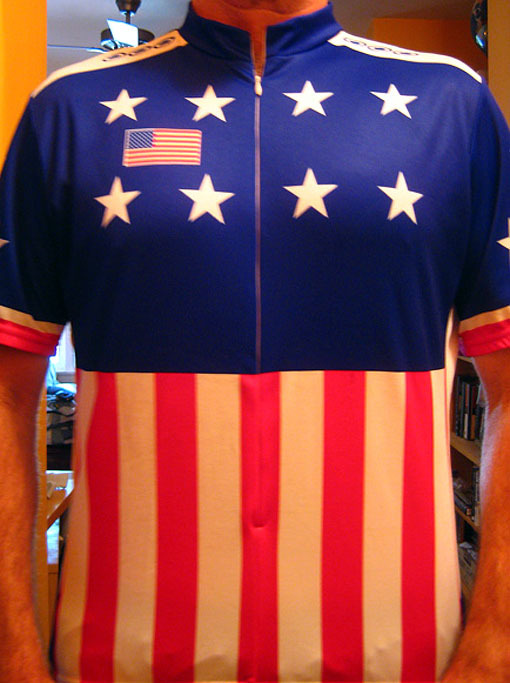 Most jerseys are decidedly less outrageous than this star-spangled spandexness, purchased a long time ago (in the immediate aftermath of 9/11 to be exact) in a fit of genuine love o’ country and pedaled around town with pride. Speaking of fit, it is remarkably less clingy now then the last time I wore it on the first anniversary of the tragedy. This entry was posted on Thursday, July 3rd, 2008 at 7:08 am and is filed under biking, clothing. You can follow any responses to this entry through the RSS 2.0 feed. Both comments and pings are currently closed.